Cariad's Marvellous Cider is a single variety Egremont Russet cider. No adjustments or taming, just a charismatic cider with bite and the noticeable nutty profile of Egremont. This is a very special cider. My daughter, Cariad, who lives with a form of muscular dystrophy called Spinal Muscular Atrophy (type 1) made it. Well, not exactly all of it - she chose the apples, helped mill apples and then helped press them. 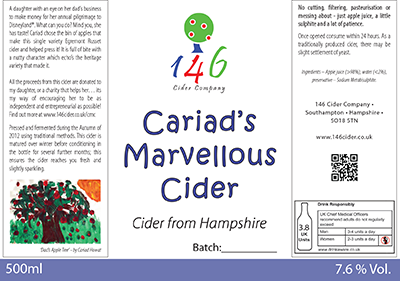 This cider is produced and sold to raise money for Cariad and the Cariad Rose Trust - which aims to provide her with experiences, equipment and 'stuff' that will help make her life as normal as possible and as enriched as she can take. The cider was pressed in November 2012 and fermented over winter using wild yeasts.